I haven’t had any luck with frozen Crock-Pot meals in the past. 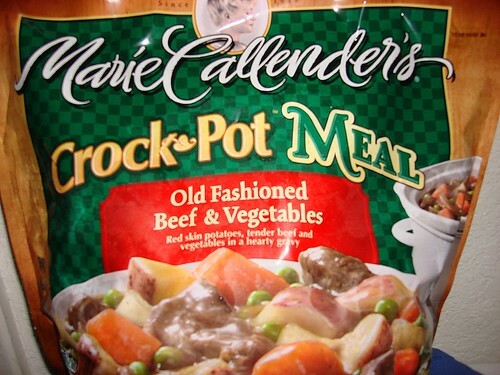 This particular bag looked worth a shot though, having the Marie Callender’s name and consisting of ingredients that everyone in my family will eat. As a bonus, this meal is fairly nutritious with only 150 calories per serving. There are 4.5 grams of fat, 13 grams of protein, 4 grams of dietary fiber, and 50% of your Vitamin A for the day! It’s 550 mg of sodium (23% of daily value) was not so bad either. The contents of the bag were 1 sauce pouch, 1 potato pouch, and the meat & vegetables. My initial reaction when I opened the sauce pouch and smelled it was, “Gerber Mixed Vegetables…?” That threw me off a little, but I continued with the package directions placing the potato pouch in the refrigerator, stirring the sauce pouch into hot water and the beef & vegetables into the sauce. Then I turned on the Crock-Pot to low for 8-10 hours. Easy! In the last 35 minutes of cooking time, I turned the heat to high and stirred in the potato pouch. The potatoes were cut into well-sized chunks. Some larger than others, but all very fresh looking. The Vegetables – Most of the carrots were in large chunks and some were cut thin. I’m guessing the non uniformity was to make the Beef and Vegetables seem homemade. (but I cut my carrots uniformly for the Crock-Pot, Marie!!) The peas were visible although I couldn’t really taste them. The potatoes were just right. The Beef – The beef chunks were fairly large. 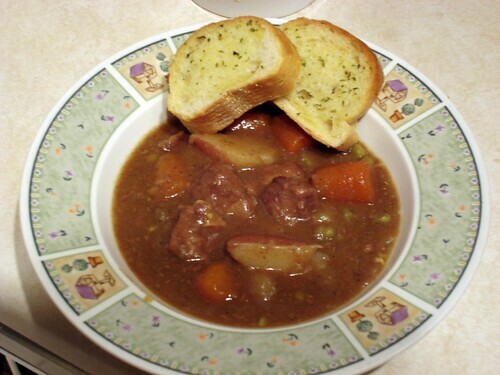 They had a good taste and were equivalent to any beef stew meat I’ve had in a Crock-Pot…sort of fatty, sort of tender, and sort of chewy. My only complaint was the amount of beef chunks in the bag. (I forgot to count) To evenly disperse the chunks to a family of 8 like the package suggests would be difficult. It was a hit! A mild hit, but a hit nonetheless. Everyone dished out seconds and no one left the table hungry. This entry was posted on Tuesday, April 1st, 2008 at 1:59 am	and is filed under dinner, review. You can follow any responses to this entry through the RSS 2.0 feed. You can leave a response, or trackback from your own site. If any of you are a fan of FMyLife, the Onion, or Cracked then you’ll probably get a kick out of WeedStories too! Post your own and get voted to the top or enjoy the stories that are being posted by everyday people across the country. Come on, you know you have one too! Hello my friend! I want to say that this post is awesome, nice written and include almost all significant infos. I’d like to see more posts like this . Hi, Well put together publish. There’s a trouble with your internet site around industry, could click here? IE ‘s still industry head along with a major part of other folks leaves out your amazing creating for this dilemma.